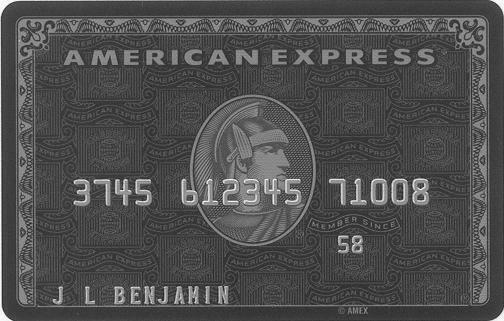 Does Barclays’ really think that a black-colored card that is advertised constantly to the masses during televised sporting events is really going to attract the same high-spending, high-ticket type of consumers that Amex Centurion does with its invite-only, 250k miminum-spend card?!? It’s the same people that already have a regular Visa credit card that its going to attract, and that isn’t the high net-worth individuals that Centurion already has. I think Barclay’s has done this at the perfect time. The Centurion will require 500K in spending in 09″ as well as the 2500 annual fee. The features are very similar and for me this is a far better deal than the Centurion. I received my Visa Black Card a few weeks ago. I called customer service today to ask about the material, because mine seems to be made of ordinary credit card plastic. The representative told me it is indeed made of plastic, not carbon graphite. She said the “numbers were falling off” the original carbon graphite card, so they switched to plastic. There are currently no plans to switch back to carbon graphite. I am not only curious about what criteria are used to determine who will be the 1%, but even more so, how perspective members are found, for promotion by mail. I have a high credit rating and several credit and charge cards,in good standing,(with much better deals than this one), and I was not solicited for this Black Card. However, my late husband received a large, black envelope, with an application to apply. He’s been dead for 7 years and is listed as deceased with all matters of credit and banking. 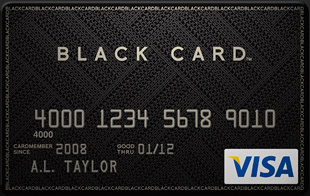 I thought it was a funny coincidence, for a deceased person to receive an ad for a BLACK card, in this funereal design, and when I saw that it’s only for 1%, I wondered if one of the criteria is being deceased? lol But seriously, it shows poor research technique, in marketing. PFFFFFFT card melting from overuse? How the hell much can you use it for that? HA. Break? Sure I’d buy that. Run down the magstripe? Sure. MELT? LOLOL. Man I needed that laugh. It’s not like they couldn’t issue new cards anyway. >_> you will not have the same card forever. I mean c’mon. It expired. I got an invite today for that elite 1%. I think this is HILARIOUS because my credit is damn scary from student loans. Plus, I am using CCCS to pay my other credit cards. Clearly, such careful screening. Good deal. I like her music a lot. It really temped me when folks say something like since she’s 40 she shouldnt create music anymore. Thats unreasonable. Carry it J.Lo!